J&R younger units include Karmiel, Tira, Jerusalem and Shalom—providing campers with age- and developmentally-appropriate activities. • Staff members are specially trained to work with first-time campers, staff to camper ratio is 1:6. • Children take swim lessons based on their skill level and enjoy free swim each day in our zero-entry mushroom pool. • Indoor play space is available and activity periods are shorter with longer transition times. • Staff members are trained to work with young campers. Staff/camper ratio is 1 to 4. • Children take daily ARC certified swim lessons based on their skill level and enjoy free swim in our zero-entry mushroom pool and Olympic-size pool. • Kindergartners have shorter activity periods than our older campers with longer transition times. • Nature hikes & campfire adventures! • Children take daily ARC certified swim lessons based on their skill level and enjoy free swim in our Olympic-size pool. • Chugim (hobby time)—Each week campers select a specialty area they’d like to develop or improve skills in. Choices include dance, art, drama, music, archery, tennis, Israeli culture, outdoor adventure, basketball and synchronized swimming. Some of our Chugim (dance, drama, music) end with performances. 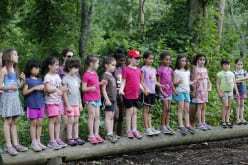 • Campers are in all-girl and all-boy groups with counselors and unitheads of the same gender. 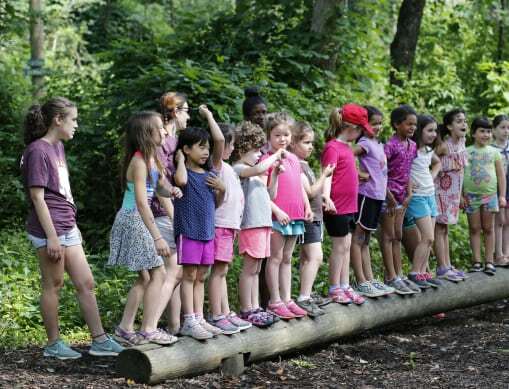 • Each session there are optional overnights with camper-friendly menus for dinner cookouts, s’mores, singing around the campfire and sleeping under the stars at J&R and EKC. • Campers in Tel Aviv and Haifa have the opportunity to customize their weekly schedules.